Loon is the common name for fish-eating, aquatic birds comprising the genus Gavia of their own family (Gaviidae) and order (Gaviiformes), characterized by legs placed far back on the body, a long beaks, webbed feet, and a unique laughing call. They are found in North America and northern Eurasia and are also known as divers (for example, in the United Kingdom and Ireland), being expert diving and swimming birds but very poor at maneuvering on land. There are five extant species of loons. While advancing an individual function of survival, reproduction, and self-maintenance, this taxonomic group also provides a function for the ecosystem and for humans. Ecologically, loons are part of food chains, consuming fish, frogs, salamanders, crayfish, leeches, and so forth, and being preyed upon by large carnivorous fish, snapping turtles, gulls, eagles, and crows. For humans, their unique behaviors—such as diving underwater for fish, awkwardly moving on land, long takeoffs for flight, and haunting vocalizations—add to the wonder of nature. Loons are about the size of a large duck or small goose, which they somewhat resembles in shape when swimming. Their plumage is largely black-and-white, with gray on the head and neck in some species, and a white belly, and all species have a spear-shaped bill. Loons have webs between their three front toes and pointed wings. Loons are excellent swimmers, using their feet to propel themselves above and under water and their wings for assistance. Because their feet are far back on the body, loons are poorly adapted to moving on land. They usually avoid going onto land, except when nesting. All loons are decent fliers, though the larger species have some difficulty taking off and thus must swim into the wind to pick up enough velocity to get airborne. Only the red-throated diver can take off from land. Once airborne, their considerable stamina allows them to migrate long distances southwards in winter, where they reside in coastal waters. Loons can live as long as 30 years. The European name "diver" comes from the bird's habit of catching fish by swimming calmly along the surface and then abruptly plunging into the water. The North American name "loon" comes from the bird's haunting, yodeling cry. Loons find their prey by sight. They eat fish, amphibians (frogs, salamanders), and invertebrates such as crustaceans (crayfish), mollusks (snails), insects, and annelids (leeches). They prefer clear lakes because they can see their prey more easily through the water. The loon uses its pointy bill to stab or grasp prey. They eat vertebrate prey headfirst to facilitate swallowing, and swallow all their prey whole. To help digestion, loons swallow small pebbles from the bottoms of lakes. Similar to grit eaten by chickens, these gastroliths may assist the loon's gizzard in crushing the hard parts of the loon's food such as the exoskeletons of crustaceans and the bones of frogs and salamanders. The gastroliths may also be involved in stomach cleaning as an aid to regurgitation of indigestible food parts. 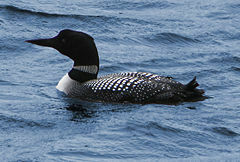 Loons may inadvertently ingest small lead pellets, released by anglers and hunters, which will slowly lead to the loon's death by lead poisoning. Among jurisdictions that have banned the use of lead shot and sinkers are included Maine, New Hampshire, Vermont, some areas of Massachusetts, Yellowstone National Park, Great Britain, Canada, and Denmark. Common loon on the nest. During the summer, loons nest on freshwater lakes and/or large ponds. Smaller bodies of water (up to 0.5 km²) will usually only have one pair. Larger lakes may have more than one pair, with each pair occupying a bay or section of the lake. Loons build their nests close to the water, preferring sites that are completely surrounded by water. They may use the same site from year to year. Loons will use a variety of materials found nearby to build their nests, including pine tree needles, leaves, grass, moss, and sometimes clumps of mud. Both the male and female help with nest building and incubation, which usually lasts 26 to 31 days. If the eggs are lost, the pair may re-nest, often in the same general location. Usually one or two eggs are laid in June. Loon chicks are precocial, able to swim right away, but are often seen riding on their parents' back. This behavior allows the chicks to rest, conserve heat, and avoid predators such as large carnivorous fish, snapping turtles, gulls, eagles, and crows. After a day or two, chicks cease returning to the nest but remain in their parent's company. Chicks remain with and are fed exclusively by their parents for about eight weeks. After eight weeks, chicks will begin to dive for some of their own food. By 11 or 12 weeks of age, chicks are able to gather almost all of their own food and may be able to fly. A pair may mate for life, although banding studies have shown that loons will sometimes switch mates after a failed nesting attempt and even between nesting attempts in the same season . Male loons appear more faithful to breeding territories than to mates. Black-throated diver or Arctic loon (Gavia arctica). All living species of loons are classed in the genus Gavia. The loons formerly were often considered to be the most ancient of the northern hemisphere bird families; this idea grew basically out of the perceived similarity of shape and (probably) habits between loons and the entirely unrelated extinct Cretaceous order Hesperornithiformes. However, the two groups are merely superficially similiar, likely the product of convergent evolution and adapted in a similar way to a similar ecological niche. This already was proposed in the early twentieth century. More recently, it has become apparent that the Anseriformes (waterfowl) and the Galliformes likely are the most ancient groups of modern birds, with the loons (Gaviiformes) belonging to a more modern radiation. What is also generally accepted as a fact is that loons and grebes are not closely related at all, but rather one of the most stunning examples of convergence in the known birds. The Sibley-Ahlquist taxonomy still allies the loons with the grebes in its paraphyletic "Ciconiiformes," and it is almost certain that the relationships of loons lie with some of the orders united therein. Alternatively, loons have tentatively been considered to share a rather close relationship with waders, penguins, or procellariiform seabirds. Gavia" portisi from the Late Pliocene of Orciano Pisano (Italy) is known from a cervical vertebra that may or may not have been from a loon. If so, it was from a bird slightly smaller than common loon. Older authors were quite sure the bone was indeed from a Gavia and even considered G. concinna a possibly junior synonym of it. This is now regarded as rather unlikely for reasons of biogeography. Interestingly, an Early Pliocene loon skull form Empoli (Italy) was referred to G. concinna. The vertebra may now be lost, making "G." portisi a nomen dubium. In addition, there are some much older forms that are sometimes assigned to the Gaviiformes. From the Late Cretaceous, the genera Lonchodytes (Lance Formation, Wyoming) and Neogaeornis (Quinriquina Formation, Chile) have been described; the latter might have been a primitive loon, but possibly a hesperornithiform, and both have sometimes been allied with the orders which are considered related to loons. Doubtfully valid and surrounded by considerable dispute is the supposed Late Cretaceous loon Polarornis (Seymour Island, Antarctica). Eupterornis, from the Paleocene of France, has some features reminiscent of loons, but others seem more similar to Charadriiformes, such as gulls (Laridae). A piece of a carpometacarpus supposedly from Oligocene rocks near Lusk, Wyoming was described as Gaviella pusilla, but this also shows some similarities to the plotopterids. Parascaniornis, sometimes allied to the loons, has more recently determined to be a junior synonym of the hesperornithiform Baptornis. ↑ United States Fish and Wildlife Service (USFWS). 2005. Common loons at Seney NWR, June 2005. United States Fish and Wildlife Service. Retrieved July 20, 2008. ↑ Montana Fish, Wildlife & Parks (Montana FW&P). 2007. Animal field guide: Common loon. Montana Fish, Wildlife & Parks. Retrieved July 20, 2008. ↑ M. Stolpe, (1935). Colymbus, Hesperornis, Podiceps: Ein Vergleich ihrer hinteren Extremität. Journal of Ornithology 80(1): 161-247. [Article in German]. Retrieved July 20, 2008. ↑ National Museum of Natural History 1661, distal right tibiotarsus. Smaller than common loon: Wetmore (1941), Olson (1985). ↑ 6.0 6.1 6.2 J. Mlíkovský 2002. Cenozoic Birds of the World, Part 1: Europe. (Prague: Ninox Press. ISBN 8090110538), 64. Retrieved July 20, 2008. ↑ Brodkorb (1953), Mlíkovský (2002): 64). ↑ P. Brodkorb (1953). A review of the Pliocene loons. Condor 55(4): 211-214. Retrieved July 20, 2008. Brodkorb, P. 1953. A review of the Pliocene loons. Condor 55(4): 211-214. Retrieved July 20, 2008. Heinrichs, A. 2003. Minnesota. Compass Point Books. ISBN 0756503159. Mayr, G. 2004. A partial skeleton of a new fossil loon (Aves, Gaviiformes) from the early Oligocene of Germany with preserved stomach content. Journal of Ornithology 145: 281-286. Retrieved July 20, 2008. Minnesota Pollution Control Agency. 2007. Let's get the lead out! Non-lead alternatives for fishing tackle. Version of June, 2007. Retrieved July 20, 2008. Mlíkovský, J. 2002. Cenozoic Birds of the World, Part 1: Europe. Prague: Ninox Press. ISBN 8090110538. Retrieved July 20, 2008. Montana Fish, Wildlife & Parks (Montana FW&P). 2007. Animal field guide: Common loon. Montana Fish, Wildlife & Parks. Retrieved July 20, 2008. Moran, M., M. Sceurman, L. S. Godfrey, and R. D. Hendricks. 2005. Weird Wisconsin: Your Travel Guide to Wisconsin's Local Legends and Best Kept Secrets. Sterling Publishing. ISBN 0760759448. Olson, S. L. 1985. Section X.I. Gaviiformes. Avian Biology 8: 202-214. Stewart, B. D. 2004. Across The Land: A Canadian Journey Of Discovery. Victoria, BC, Canada: Trafford Publishing. ISBN 1412022762. Stolpe, M. 1935. Colymbus, Hesperornis, Podiceps: Ein Vergleich ihrer hinteren Extremität. Journal of Ornithology 80(1): 161-247. [Article in German]. Retrieved July 20, 2008. United States Fish and Wildlife Service (USFWS). 2005. Common loons at Seney NWR, June 2005. United States Fish and Wildlife Service. Retrieved July 20, 2008. Wetmore, A. 1941. An unknown loon from the Miocene fossil beds of Maryland. Auk 58(4): 567. Retrieved July 20, 2008. How to Identify Loons and Their Calls. This page was last modified on 25 July 2018, at 16:11.